A familiar face is coming back to Grey’s Anatomy. Deadline reports Kim Raver will return for season 14 of the ABC TV show. 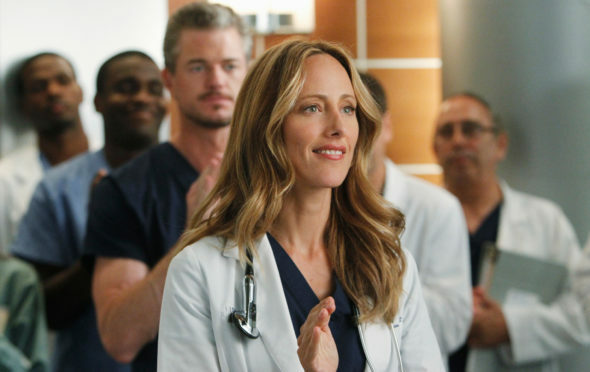 Raver played Dr. Teddy Altman on seasons six through eight of the medical drama, which also stars Ellen Pompeo, Justin Chambers, Chandra Wilson, James Pickens Jr., Kevin McKidd, Jessica Capshaw, and Jesse Williams. Raver will reprise the role of Dr. Teddy Altman for season 14 of Grey’s Anatomy, which is set to premiere this fall on ABC. What do you think? Do you watch Grey’s Anatomy? Are you glad Dr. Altman will be returning? Ms. Raver’s return to the show is rather unfortunate. There is something highly irritating about her acting style, and has been since after Third Watch. Oh well. Great to see Teddy come back to Grey’s. She brings back a lot of history with Hunt. A good addition for the new season! Loved Teddy! So glad she’s coming back. I wondered why she was never mentioned after she left the show the first time, the way Burke, George, Izzy, et al were. Hope she stays on permanently. Grey’s rocks! My favorite show since season one. I LOVE Teddy !! Happy to see her back – I’d like to see Torres come back as well. Grey’s is one of the BEST series on prime time TV.